Maybe you’ve noticed that we’re pretty obsessed with color around here. Whether we’re working in yarn, fabric, knotting cord, or embroidery thread, we closely consider and exhaustively discuss our color choices… often passionately! 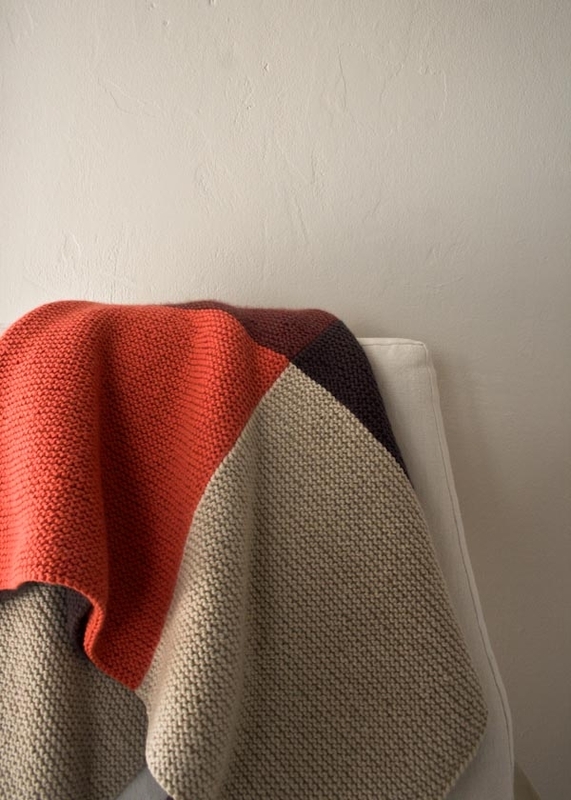 So in the spirit of our love of color, I give you the Color Study Blanket. For this project I turned to some of our most beloved yarn, Purl Soho’s Worsted Twist. I used them not just for their cozy and cushy feeling in garter stitch, but also because of their incredible palettes of color. 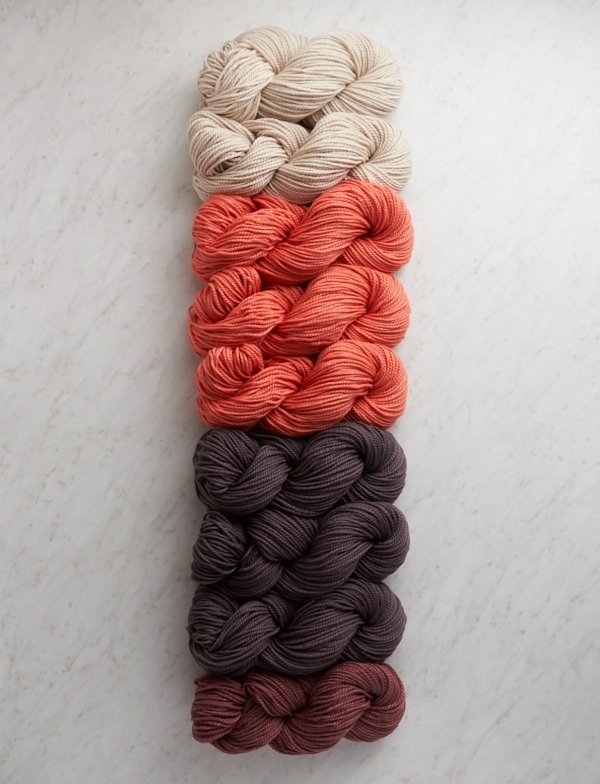 Color A: 2 skeins of Purl Soho’s Worsted Twist, 100% merino wool. 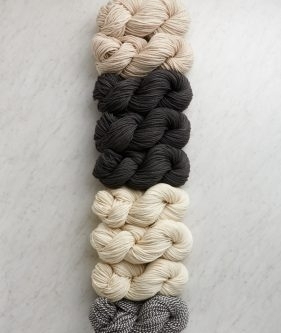 Color B: 3 skeins of Purl Soho’s Worsted Twist, 100% merino wool. Color C: 3 skeins of Purl Soho’s Worsted Twist, 100% merino wool. Color D: 1 skein of Purl Soho’s Worsted Twist, 100% merino wool. Our sample, photographed here, is worked up in the palette BEGONIA. The colorwork in this project is done with a technique called “intarsia.” Each row involves either two or three balls of yarn, which is much easier than it may sound! 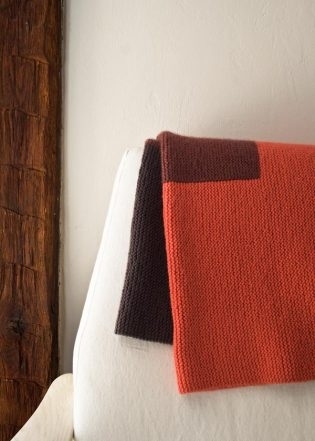 For some tips on this technique, visit our Intarsia in Garter Stitch Tutorial. NOTE: When you switch colors in the following rows, be sure to use the intarsia techniques described in our Intarsia for Garter Stitch Tutorial. Row 1 (right side): With Color A, k58; with Color B, knit to end of row. Row 2 (wrong side): Slip 1 knitwise; with Color B, k115; with Color A, knit to end of row. Row 3: Slip 1 knitwise; with Color A, k57; with Color B, knit to end of row. Repeat Rows 2 and 3 until piece measures 13 inches from cast-on edge, ending after working a wrong-side row (Row 2). Row 1 (right side): Join Color C and k58; join Color D and k58; join Color B and knit to end of row. Row 2 (wrong side): Slip 1 knitwise; with Color B, k57; with Color D, k58; with Color C, knit to end of row. Row 3: Slip 1 knitwise; with Color C, k57; with Color D, k58; with Color B, knit to end of row. Cut Colors B and D.
Row 1 (right side): Slip 1 knitwise; with Color C, k115; join Color A and knit to end of row. Row 2 (wrong side): Slip 1 knitwise; with Color A, k57; with Color C, knit to end of row. Row 3: Slip 1 knitwise; with Color C, k115; with Color A, knit to end of row. Repeat Rows 2 and 3 until piece measures 39 inches from cast-on edge, ending after working a right-side row (Row 3). Bind Off (wrong side): With Color A, loosely bind off 58 stitches knitwise (one Color A stitch will remain on the left needle), cut Color A; with Color C, bind off remaining stitches knitwise, cut Color C and pull through remaining stitch. Love this! I’m looking for a larger size blanket; can I double this? If so…how? Thanks! Thanks for writing in and our apologies for the delayed response! We have received a lot of requests for a larger blanket and we appreciate the enthusiasm for this pattern. Stay tuned for further developments on this lovely blanket! I was about to start this blanket, but considered switching to a larger blanket design until I read your comment on March 31st. Might your larger blanket directions be created this week? Thanks for writing in! We will not have a larger version of this blanket coming out this week. This has been a popular request by customers and we are taking that into consideration. Thanks again! Wondering if Row 1 of the Continue with 3 colors section should have the first stitched slipped knitwise as the other rows of if this is a unique start? Thank you for writing in! You’ll work Row 1 of the “Continue with 3 Colors” section as written (so, no slipped stitch), just like Row 1 of the “Begin with 2 Colors” section has no slipped stitch. I love, love, love this. My only problem is that I need to make it larger! Probably 20 ” larger. How do I cast on – I know the person I am going to make this for will love it! Can I increase the size to accommodate a taller 6’2″ guy? Thanks. Thanks for writing in and our apologies for the delayed response. We have received a lot of requests for a larger blanket and we appreciate the enthusiasm for this pattern. Stay tuned for further developments on this lovely blanket! Why do you use the light gray print that looks so faded out that it is hard to read? This is a big turn off to a lot of people…enough to make them look elsewhere. You have a great site and should make it appealing to all. Thank you for writing in! Thank you for your concern, I will be sure to pass your suggestion on to our web design team. Hi there, love love this blanket! Just wondering do you have any tips on making it in a large size please? I love intarsia and this is beautiful! As always: simple is best! On January 17th we arrived in NY . We are from Friday Harbor, Washington. We had been on the Queen Mary from Southampton to NY for seven days. My husband and I took a cab to SoHo to find your store. What a delight! I am so glad we made the effort to find you. I am a ‘new’ knitter (having knitted over 54 years ago, with a failed project for my sweetheart, while in college), and decided to try it again. Don is still my sweetheart, now married 50 years and I LOVE knitting this time around. The Queen Mary has a knitting group that meets each day at 2:30; I joined that group for three weeks and now have “knitting malaria”!! I wish I lived in NY, just for your store! Thank you for being there at just the right time in my life. I love getting your newsy letters and plan to do more knitting. Your shop and newsletter are a wonderful inspiration. Thank you so much for your kind words and for sharing your story with us! What a lovely story! This is beautiful – simple and modern! 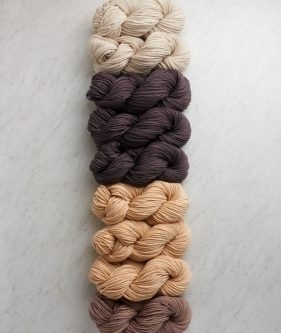 I’d love to do one with “Clementine” and a grey – can you suggest a palette that could include these two colours? Thanks for always giving us such beautiful ideas – can’t wait to visit your shop! Thank you so much for writing in! 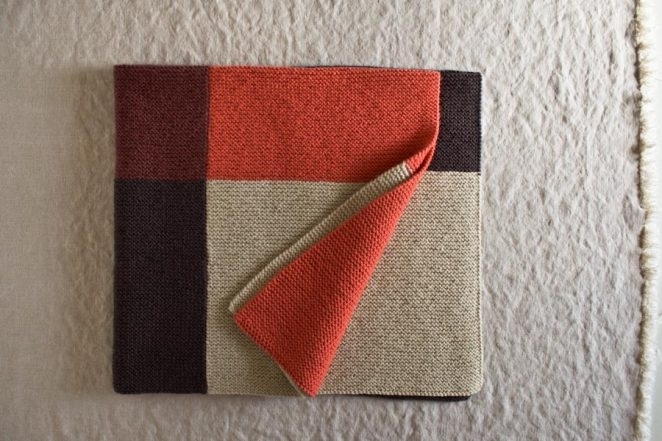 I think this blanket with an orange and grey palette would be so much fun! I recommend Clementine, Paprika Red, and Dark Loam. The Dark Loam can read a bit brown sometimes, but I think that will complement the Paprika Red. If you would rather a grey that is unquestionably grey, I recommend the Toasted Charcoal. Again, thank you for writing in! If you have further questions, please let us know! I would *love* a crochet pattern for this blanket. Thanks for writing in! We are so glad that you are inspired by our newest blanket! We do not currently have a crochet version of this pattern but we will certainly keep your request in mind! Thanks for writing in! We have received a lot of requests for a larger blanket and we appreciate the enthusiasm for this pattern. Stay tuned for further developments on this lovely blanket! I think I am addicted to making your blankets have already made 3 x Forever Blankets, 1 x colour block and just bought the wool for this one, can’t wait to start. Your colours are always so inspiring, thank you. I love the blanket and it is my first attempt at intarsia, which has been going well. However now I need to ” join” the colors, as in “continue working with three colors.” How do I do that? How do I join the colors? And how do I join B to C to keep the intarsia going cleanly. Thank you for your interest in this pattern! Intarsia seems fancy, but it’s actually quite easy once you wrap your mind around the motions. Essentially, you will be knitting part of the row with one color, dropping that color, and then continuing the row with a new color. 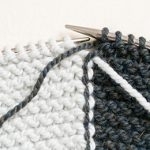 When joining a different color on the right side of the work, cross the old yarn over the new yarn and knit the next stitch with the new yarn. This twists and locks the colors together. On the wrong side, bring the old yarn to the front purl position and cross it over the new yarn. This also locks the yarns together, creating a visible “jog” on the back side of the piece. To see our intarsia in garter stitch tutorial, please see the below link! Thanks for your interest in this pattern! We have been receiving requests to make this blanket larger and we love to make our customers happy! Though we currently don’t have the resources to customize patterns, we will keep this request on our radar. Stay tuned! Could this be adapted to a baby blanket size ? Sorry didn’t read the dimensions before asking my question! I bought the kit, but I’m confused about the pattern – it calls for circular needles. I don’t understand how a square blanket is worked on circular needles. Help! Is there a tutorial video for this project? Thank you for writing in! We knit this blanket on circular needles because it is too wide to fit on straight needles. You’ll knit on the circular needs the same way you would on straight needles, the only difference is that once you get to the end of the row you’ll flip your work and move the needle that is in your right hand to the left hand and the needle that is in your left hand to your right. Please let us know if you have further questions. 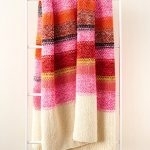 I have two questions about the color study blanket. It has a very definite right and wrong side, doesn’t it? 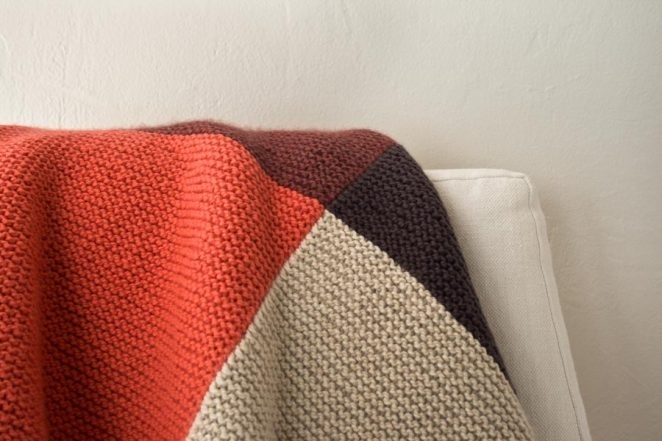 In order to enlarge the blanket into a lapsize, @ 54×54, would I buy the kit with additional yarn or could you recommend amounts for me? Any tips for keeping the yarn from getting tangled? Typically I would cut it and butterfly it, but the color blocks are so large, I don’t feel confident that my joining method will hold up. Thank you for writing in to us! Unfortunately, there is no way I know of to do intarsia on such a large scale without working with the entire skein. When doing such a large intarsia piece, I find myself finding a system to organize the yarn balls and repeating that exactly each row. Intarsia can be quite methodical! Dang! I’ve been working this without slipping the first stitch of each row. It’s about 3″ from the cast on edge & looks ok so far. This is going to be a gift, so I want to make sure it comes out like the pictures. Should I keep going as is, or rip it out & start over? Thanks in advance for your help. It is perfectly acceptable to not slip the first stitch of each row. Many people omit this step. At Purl it is just our stylistic preference. It is up to you whether you like the not-slipped look or not, but if it is not bothering you then you should keep going! Hi! When starting the section with 3 colors, how do I join color C and color D? Thanks for writing in! You simply start knitting with color C at the beginning of the row. When you get to the point where you need to add color D, you will cut color A, leaving a tail, pick up color D and twist it over color C and continue the row with D. To knit with color B you will have to cut the yarn and continue knitting B further on down the row. If you have gaps at first, do not fear. You can simply tighten them when weaving in the ends. I suggest doing this after an inch of knitting, so the holes don’t get too big. I hope I have answered your question clearly! Hello I have purchased this kit and really want it to be longer the width is fine . Please give me your input so that I can purchase more yarn . 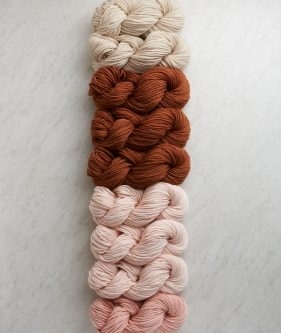 Are more hanks of yarn available in Begonia colorway? Thanks for writing in! 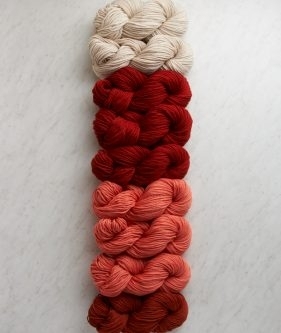 You can certainly purchase additional skeins of each color in the Begonia colorway. The colors used in this colorway are Worsted Twist Heather in Wheat Flour and Mixed Berry and Worsted Twist in Pink Grapefruit and Gray Fig. Hi! I’m not as comfortable with circular needles just yet — is it possible to complete this pattern with straight needles? Thanks for your interest in this pattern. Unfortunately it is impossible to knit this blanket on straight needles. The cast on amount is too many stitches to fit on a flat needle. I suggest you purchase a circular needle with a long cord so there is no chance of you accidentally knitting in the round. Best of luck to you. Any chance you have a photo of the completed blanket in the Winter Sky color grouping? Thanks for writing in! Unfortunately we don’t have this colorway knit up; it’s just a color suggestion. I think it’s beautiful though and you can also check Ravelry to see if anyone has knit it up in these colors. Not sure if my comment went through properly…I’m interested in selecting a different palette than the ones you have suggested. I love the brown and orange palette but doesn’t work with my decor. 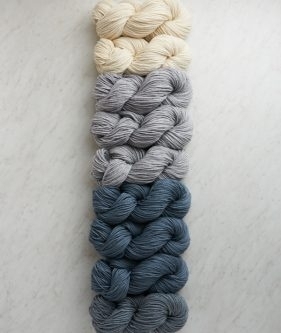 I see the 4th color is probably the most critical – to “blend” – not being able to view your yarns, I’m confused how to plan out a palette to utilize gray with “something” else. I thought olive green but maybe there’s a better combo! Please help! Thanks for writing us! Since you’ve mentioned olive green, I’ll go with that! I suggest that you use Worsted Twist in Terra Green (sale color!) for color B and Worsted Twist Heather in Tabby Gray for color C. In the center I recommend using Worsted Twist Heather in color Mixed Olive. Color A can be anything! 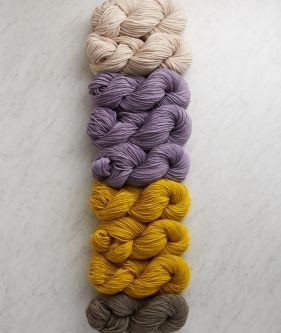 For a pop you can do Worsted Twist in color Yellow Zest or for something more natural you could choose Worsted Twist Heather in color Wheat Flour. I think both would be really sharp. Let me know what you think! Thank you so much! I just placed the order! I’m now committed! This was a combo I was entertaining but wasn’t so confident without actually seeing the proper hues. You’ve got them in front of you with your creative eye! Having your stamp of approval, I’m set and inspired now. I’m so happy you’re pleased! Good luck and happy knitting! Got the yarn today. It’s a bit dark. Do you think it will be good when knitted? Encouragement? I think the blanket will look great! You have the Yellow Zest in there right? If you want to exchange the Terra Green for the Green Gray color, that could lighten up the look! Let me know what you think! No I went with the Wheat Flour, Mixed Olive, Tabby Gray and Terra Green. What gray green color are you suggesting? Please let me know which color you aren’t sure about and I’ll try to help you choose another one. I like the color combo you have, but if you are unsure bout it, I’ll certainly help you find the best choice for you. Thanks for your interest and your kind words! At this time there is not a crochet version of this blanket! We will certainly keep your request in mind for future projects! I’m currently making the Color Block blanket using a combo of gray, green, gray-green and wheat for myself. You helped select the colors so thanks for that. Now I’d like to knit one for my sister whose sofa colors are shades of hot pink, rose and grays. 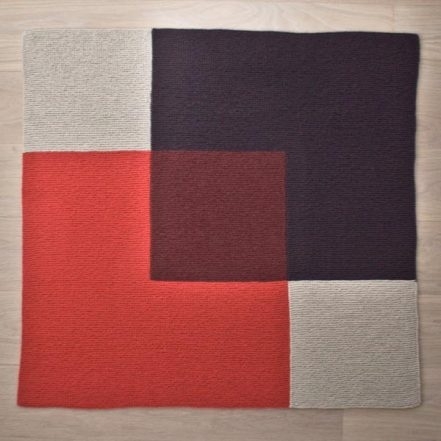 Can you review these colors and put together another perfect and uniquely designed color block? What style cast on and bind off do you recommend for this blanket? Hope that helps! Please let us know if you have any more questions. Thanks for writing in. We don’t have any current plans to make this blanket larger but we’ll keep your suggestion in mind for the future! Thanks! Hi, I was hoping to make this blanket with a bulkier yarn to save on time. How can you adjust the number of stitches in the pattern for this? 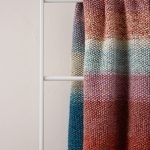 I was also thinking to add a solid Colour across the whole width of the blanket both top and bottom to make it longer. Any suggestions to help adjust the pattern would be appreciated! Thank you! Thanks for your question! 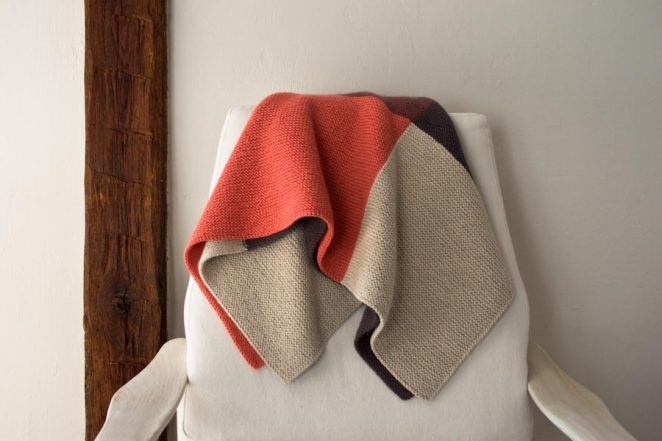 If you would like to make this blanket in a bulkier yarn the first step is to knit a gauge swatch with the yarn and needle size you would like to use. After you have done this you can measure your swatch to find out how many stitches per inch you are getting. Once you have this information you will be able to figure out how many stitches to cast on. I hope this helps! Please let me know if you have any further questions. 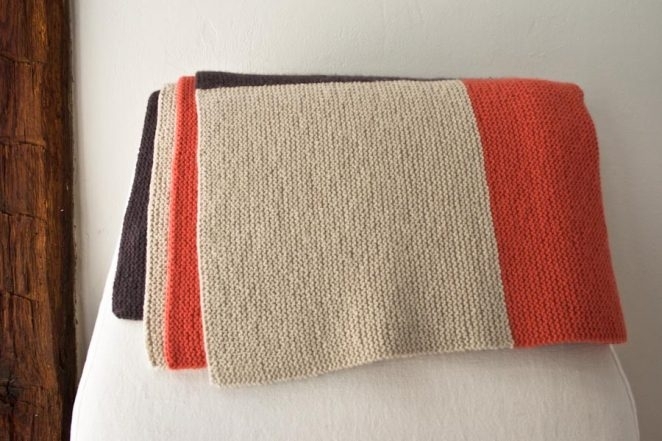 Can I make this blanket in Cotton Pure? Thanks for reaching out! This blanket is made with our Worsted Twist which is a Worsted weight yarn so the gauge would be very deferent in Cotton Pure, which is a sport weight yarn. If you wanted to do a bit of math you could adjust the pattern to make it in the Cotton Pure, but as is the pattern will not work. I am ready to make the color study blanket but would appreciate the instructions for a larger blanket. In past comments you have indicated that you would make the larger pattern available – did it happen and I missed it? Many thanks! Thanks for reaching out! We did do a larger and slightly different version of this blanket. 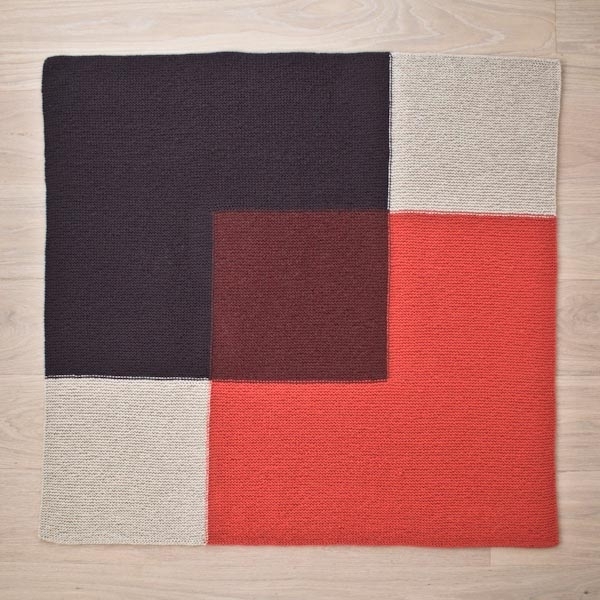 The Shadow Study Blanket is a slightly different version of the Color Study! Instead of using the 4th color, would it be possible to use colors B and C to create stripes? Color A right side and B for wrong side? Or color A right and wrong sides and then same with B? Thank you! What a cool idea! 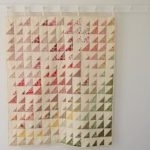 You certainly could do a striped center square to blend the colors. Since you will still need to be using Colors B and C in the same row as the stripes you are substituting for Color D, I would suggest working your stripes from separate balls of yarn and working two row stripes of each color. Best of luck, and please let us know how your stripes turn out! This is lovely but would like to make it larger. I know many people have asked this back in 2016. Any chance you can develop the pattern for a larger size soon? Thank you for your interest in this pattern! We did do a larger and slightly different version of this blanket. 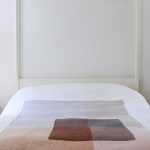 The Shadow Study Blanket is a slightly different version of the Color Study! Thanks for reaching out! I’m sorry to say that Toasted Charcoal has been discontinued – however, I think either Stillwater Blue or Tabby Grey would work well as a substitute with all the other colors in the Peppercorn palette. 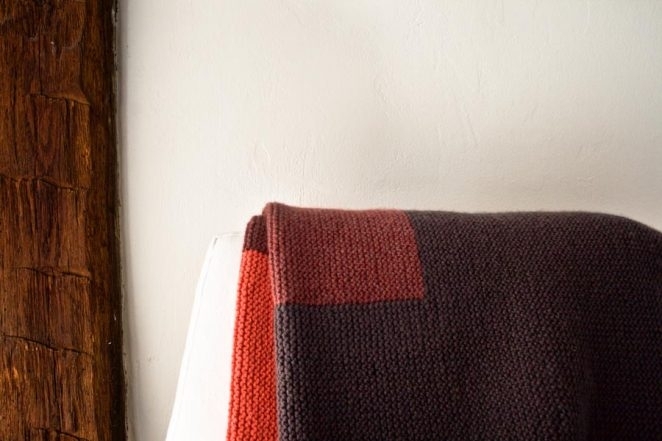 I modified the pattern for the shadow study throw to make a bigger version of this blanket, and I think the offset square makes it even more interesting! For anyone looking to make a bigger (40″ x 50″) version of the colour study blanket, give it a try! Simply make colors B&E both B, and colors C,D,F, &G all C.
I am keen to knit this blanket in the Begonia palette – can i buy the complete bundle of yarn as described? also – i live in Australia and just wanted to know if i can see the cost in australian dollars? Thank you for reaching out! Unfortunately Pink Grapefruit is a discontinued color and is no longer available so the Begonia palette is sadly unavailable. For information about International shipping rates you can go here.